Two major Australian charities, St Vincent de Paul (Vinnies) and The Smith Family have increased their “unprompted awareness” by more than 50 per cent in just four years, according to the latest McNair Ingenuity Research Awareness and Support of Leading Charities annual report. The research results, provided exclusively to Pro Bono Australia News follow an online survey of more than 3000 Australian adults who were asked to name charities they were aware of. 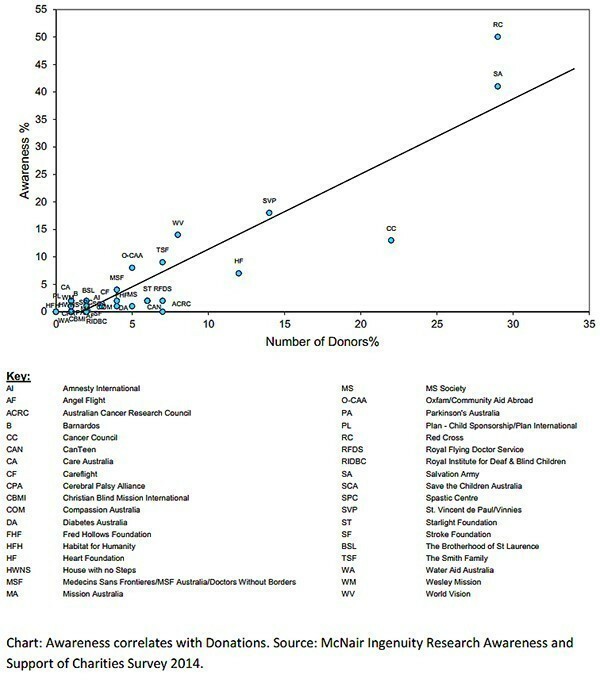 The research delivered an "unprompted awareness” list of 36 charities. Red Cross and the Salvation Army remain at the top of the ‘unprompted’ awareness list. Angela Brooks at McNair Ingenuity Research said the findings are significant because there is a direct correlation between "unprompted awareness" and the number of donors a charity will have. “The annual survey allows charities to understand where they sit in the market and delivers insights into what drives donors to donate to particular charities, along with some key strategies for charities to consider. First and foremost is awareness,” Brooks said. “The results clearly demonstrate that the number of donors positively correlates with unprompted awareness, or ‘top of mind awareness’. “Most people are likely to donate to the charities that they know best. Generally respondents recall 3-5 charities when asked and donate to the same number and usually the same charities. Survey participants were also shown a “prompted” list of 50 charities. “Whilst prompted awareness is not as good a predictor of donor level in the way that unprompted awareness is, the data indicates that recall of your charity by 80 per cent of respondents when prompted, is necessary to achieve donations from at least 10 per cent of respondents. Media and communication tools such advertising campaigns, social media campaigns or public relations campaigns. Targeted approaches such as face to face in the street or door knocking, direct mail or email campaigns. “The first method is expensive and most charities can afford to run media campaigns once a year at most, but to be effective it is important to ensure that there is enough media weight to reach your target audience,” Angela Brooks said. “It is the second method that is more interesting. Data from the McNair Ingenuity Research Awareness and Support of Leading Charities surveys shows that there is a strong positive correlation between being directly approached and donating. “The benefit of targeted approaches is that it builds awareness as well as revenue, therefore achieving two goals for the price of one. “Unfortunately the data shows that there has been a steady decline in direct approaches, with 66 per cent of people saying they have been approached by a charity in the last year, down from 88 per cent in 2009. The report said the way people are asked to donate is important and different donation methods will result in different outcomes. “The data from McNair Ingenuity Research tells us that the most popular way to give to charities is by donating to collection tins (72 per cent say they are likely to donate this way). “On the other hand only 26 per cent of respondents will sign up to make a regular donation when approached on the street. 53 per cent are likely to give to a door to door appeal. “Interestingly, the two charities that regularly conduct door to door appeals have the highest awareness AND the most number of donors, coupled with media campaigns that advertise the door knock appeals." Brooks said fieldwork for the next survey will commence in March 2015.